The future of live baitwells has arrived with the Wilderness Systems Thrive Baitwell. 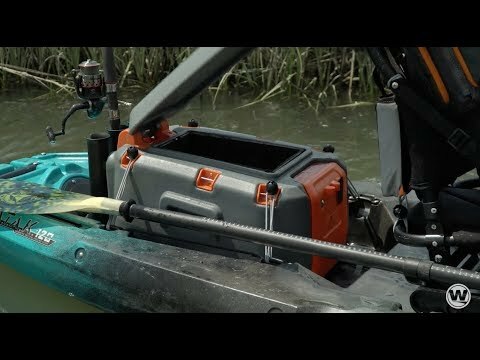 Engineered to integrate with most sit-on-top kayaks, the Thrive Baitwell features a unique exible hose system to draw water from any scupper in the rear tankwell, while a pump simplies the input/output cycle. Modern and functional, the Thrive Baitwell boasts a compact lithium battery that is chargeable by USB. Stylish and strong rubber latches secure the spring-loaded lid, and the unit is easily transported with comfortable carry handles. Three rod holders comestandard for a seamless transition from baiting to shing. This bait well will keep a large amount of bait alive all day long. I just had a dozen large 8 to 12" Pacific Mackerel in it for 7 hours and they were just as feisty at the end of the day as they were when I caught them for bait. The spring loaded lid is a nice feature, along with the rod holders. Charging is easy. If you fish live bait, this is a must have. Q: Will this fit a Predator MK? Q: would this baitwell fit in a native slayer propel 10? A: Yes, this should fit in the tankwell of that kayak. A: Yes, this will fit into that space on that kayak. Q: Will this fit a 2017 Vibe Seaghost 130? A: Thanks for your question! Unfortunately we do not stock the Vibe 120, so we don't have one available that we can physically check. The bait well measures 15 x 20 inches, so if this would fit the dimensions of your rear tankwell, this should work for you! Q: Any issues coming back in with the intake tube attached...it looks long and as though it could easily get pulled off / damaged in a surf landing. A: Hey there, thanks for the question! We've never seen any issues with the intake tube getting pulled off, it attaches pretty securely. Q: On wilderness site, it shows 20" long 15.25" wide. Which one is correct? Will it fit on Ocean Kayak trident 13? Thanks. A: It is 20" long and 15.25" wide. I measured the rear storage area of the Trident 13, and it appears that it will not fit. Please let us know if you have any other questions!